You can export the current visible frame to a Targa (.tga), Jpeg (.jpg), Photoshop Document (.psd) or Portable Network Graphic (.png) image. If you choose to export in Photoshop Document (.psd) format, the layers in your panel will be exported on separate layers in the exported image. 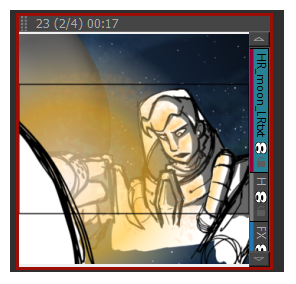 In the Thumbnails view, select the panel containing the image to export as a bitmap image file. Select File > Export > Export Current Image. The Export Current Image window opens. Select the destination folder for the image. Type a name for the image. Select the desired type from the Save as type menu. Click Save to begin the export. The image inside the frame is exported as a bitmap image file.